When I suggested to my friend, photographer Jo McAvany that we should drive over to nearby Chase Falls I imagined we’d be walking up a water filled creek to an overflowing falls and expected to be spending as much time wiping the water spray off my camera as I was taking pictures. 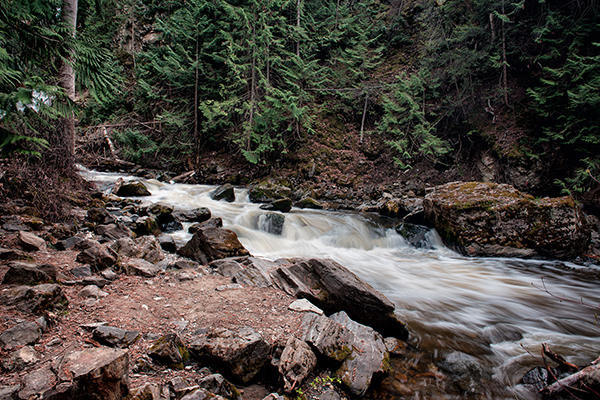 However, to my surprise the water coming over the falls was really diminished from its usual early summer flow. The narrow stream canyon had been assaulted by a lot of water at sometime in the last month or so because there were lots of large rocks where there once was sand and my usual place for wide pictures was covered by a large pile of washed out trees. 3PM on a hot, cloudless July afternoon was definitely the wrong time to photograph the falls. The bright sun was cutting its way across the left side of the canyon leaving the right side in deep shade. Even with graduated ND filters, trying to balance the scene’s high contrast was impossible. Nevertheless I scrambled up and over the scattered boulders to find a better position, while Jo chose to work along the bank under the trees accompanied by, as she soon noticed, an ever-growing swarm of mosquitoes. I guess there were enough breezes coming from the falls to push the mosquitoes away from my position, or maybe I was so fixed on my struggle to get some kind of image out of the contrasty scene that I didn’t notice their feasting. I stacked ND filters over my lens and pointed my camera either into the sun or into the shade. It was one or the other if I didn’t want over or under exposures in my captures. When I clambered back to where Jo was I found she had all but given up on the harsh lighting and was photographing people zip-lining above us. Well, that and giving her self up to the blood sucking hoards. She mentioned to me that she was being bitten everywhere, but dedicated photog that she was she still stood waiting for another zip-liner to zoom by screaming over-head. I climbed down the bank and got a few more shots of the fast moving water and, of course, I just had to snap a couple shots of the people flying by. Jo had just about had it with the mosquitoes and I finally began to notice the pesky creatures, so even though it was cooler by the creek than back at the car, we tore ourselves away from the falls with a promise to come back covered with repellent on an overcast day. 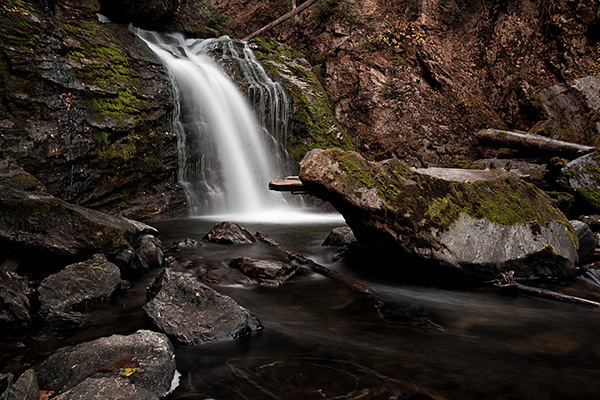 I will admit that what I like best about Chase Falls is they are only a few minutes drive from my home. It’s a cool location to scramble around and even though I have photographed it multiple times in every season during the last 40 years I have lived nearby I still enjoy making the trip there with my camera. I guess there are lots of us photographers that have photographed local subjects over and over and over again. I remember a long time old friend complaining. (Well he seemed to be) about a high mountain place we had climbed to countless times before. As we waited for the sun to rise he said, “I have taken every photograph that can be ever taken here”. I quietly continued to drink my coffee without replying. I am sure he knew I disagreed. The third season of the year is here, and it is my favourite season of the year for photography. Fall or autumn, it doesn’t matter which word is used, is so darn colourful here in British Columbia; and I really enjoy the cooler air, a welcome relief from the heat of summer. 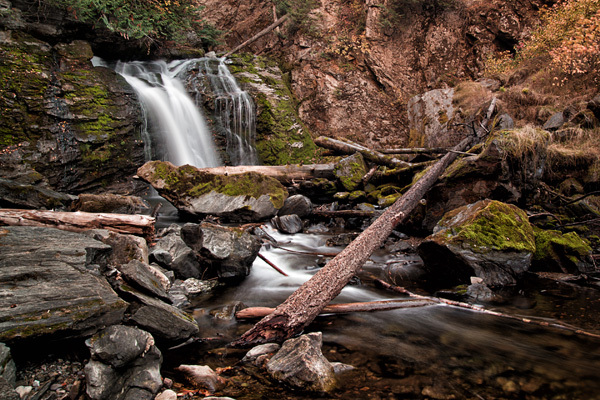 This week I drove the short distance down the road to Chase Creek Falls. 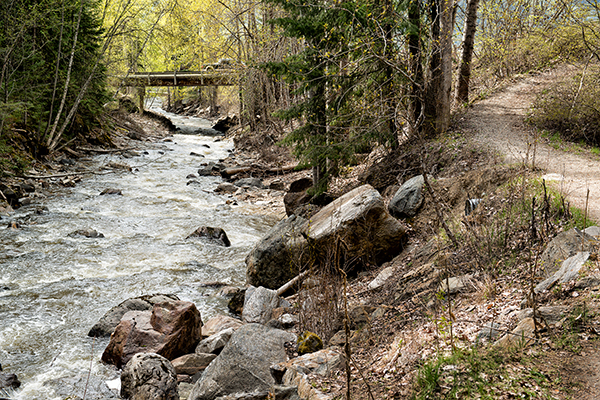 I was in April just after the spring runoff when the high water began to subside. April is the second best time to go there, October the best. 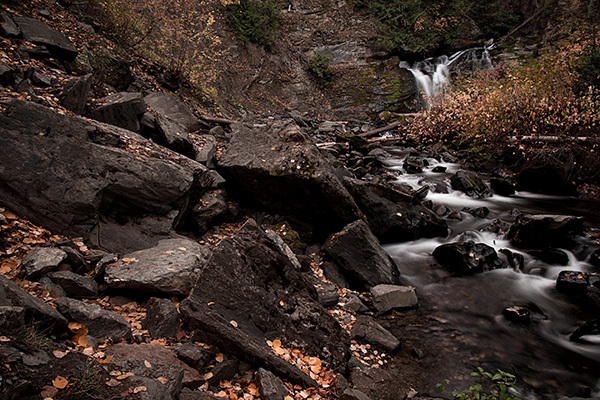 October has low water that makes scrambling along the colourful creek side easy, and lets photographers position their tripod and cameras close to the falls without getting wet. 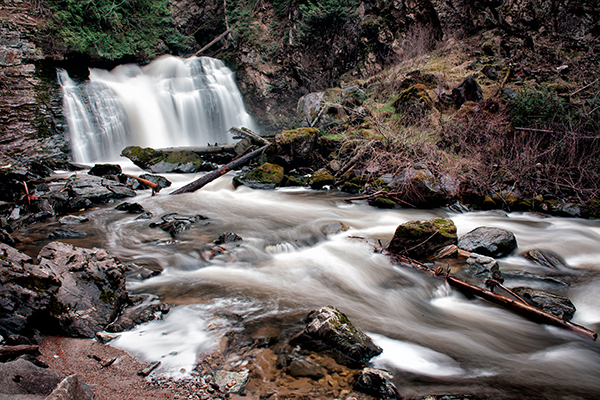 In my April article I wrote that I have been photographing Chase Creek Falls since sometime in 1976. I have used 35mm, medium format, large format, film, and digital to photograph those falls every season of the year in every type of weather using black and white, colour, and even polaroid film. I have gotten wet, walked away muddy after sliding down the steep bank, and bumped into the large river rocks a bit to hard. I’ve lost lens caps, a lens hood and even a polarizing filter on my visits. I have used the Chase Creek Falls once as a background for a large family reunion and another time for wedding portraits. Photographing waterfalls is very easy and almost as relaxing as wandering around a garden. Modern digital cameras have improved the ease of taking photos by removing the requirement of much of the technical information that photographers once needed to know. The equipment doesn’t need to be expensive or special. Select your favourite DSLR, a lens that has a wide enough focal length to see the falls, a tripod, and a neutral density filter. When I remember, I also like to use a cable release; but if forgotten the cable release isn’t a big deal, just use the camera’s self-timer instead. Setting up the camera to get that soft looking water coming over the falls is very easy. Just choose a low ISO and a small aperture. The low ISO allows a slow shutter speed, and the small aperture gives lots of depth of field. An ND, or neutral density, filter reduces the light going through the lens to the sensor and is the most trouble free filter for making long exposures. I prefer the square or rectangle ones that I can hold in front of my lens. I don’t use the fancy filter holder as that just gets in my way when I want to add additional ND filters to reduce the light. I prefer shutter speeds of three or more seconds, and adjust the ISO, aperture and ND filters to accommodate that. Next, point the camera and start making pictures decreasing the shutter speed and checking the LCD as one goes along. It is all so easy. 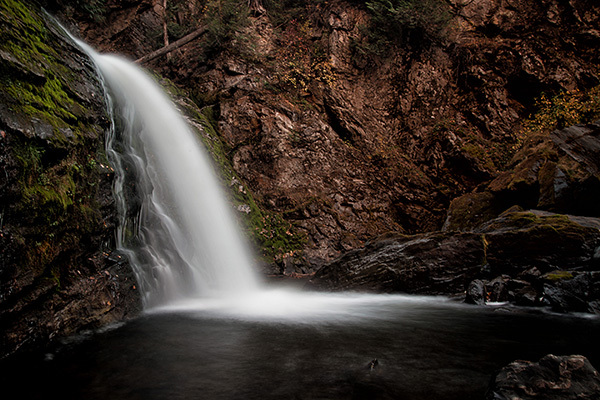 This is a perfect time of year (here in British Columbia anyway) to spend some time photographing local waterfalls. They don’t have to be large and exotic, just have a bit of water going over them. And like me, after a dozen or so shots, put the camera back in it’s bag and sit quietly in the sand and lean back on a big smooth river rock so you can enjoy the sound of the water. Life is good. Spring is here. The weather has slowly warmed up I can see from my porch that the snow on the mountaintops is diminishing, so I decided it was time to visit a waterfall not far from my home. I usually avoid waterfalls at this time of year because high volumes of murky, spring water rushing over the falls isn’t that photogenic and one never knows if the river’s bank will give away while you position your tripod. However, with the low volumes of water being reported I was sure that at Chase Creek Falls the interesting stream features like rocks and trees would be visible with the reduced water flow. When I got to Chase Falls and parked my car I noticed a small sign along the trail that said to watch for a local marmot named “Chewy”. And sure enough, as I passed a large pile of very big rocks, there was a big marmot perched on top like some amusement park guard. 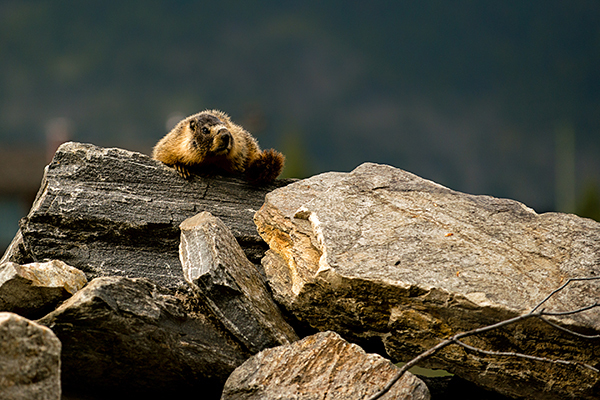 Marmots are usually shy when one walks near their burrow, but this rodent didn’t seem to be bothered in the least and readily posed for me as I hopped from rock to rock making portraits of him or maybe her. I did see a couple of immature marmots scurry out of sight; so I might be right thinking Chewy might be her instead him. When I purchased my first DSLR years ago and began learning how to use Photoshop I remember saying to a friend that what I liked best was how easily one could crop without getting the degradation that came when cropping prints made from film. The problem with 35mm film was that anything shot over 400ISO was always grainy so that shooting wide and cropping later was usually disappointing. That’s why many photographers preferred medium or large format cameras to the tiny 35mm film. I set my tripod up and focused my 24mm lens on the falls and shot wide. I knew that when I viewed my images on my computer I would choose a crop that fit the rule-of-thirds without loosing much detail. Modern DSLR sensors are much better in their ability to capture grainless detail at high ISOs than 35mm film was and even cropping away 50% of the picture doesn’t reduce the quality very much. The low water level made it easy to scramble among the large rocks along the bank and chose a comfortable location to set my tripod up. I used a couple of neutral density (ND) filters so I could reduce my shutter speed to 3, then 4, 5, and finally 6 seconds to slow the water down and I chose a small aperture for lots of depth of field. I have always enjoyed photographing that waterfall. I think I made my first photographs of it sometime in 1976, and I cannot recall how many times I have been back there since. I am fortunate to have a place like that so close to home where I can always find something to photograph.